If you haven't been to a Goodwill Store & Donation Center lately, you're in for a treat. Goodwill stores are bright, colorful, and well- organized, making it easy and comfortable for you to browse through the broad selection of merchandise. Goodwill not only offers top quality, gently-used clothing, furniture and household items, but we also provide an assortment of new, never-been-used items. You will be amazed by the assortment of new product you'll find throughout the store! Shop often. With thousands of donations received daily at each store, merchandise changes continuously. You never know when that fantastic table setting or a designer pair of jeans is going to make it onto the shelves. Our inventory is dynamic! Don't hesitate. If something catches your eye—grab it quickly! 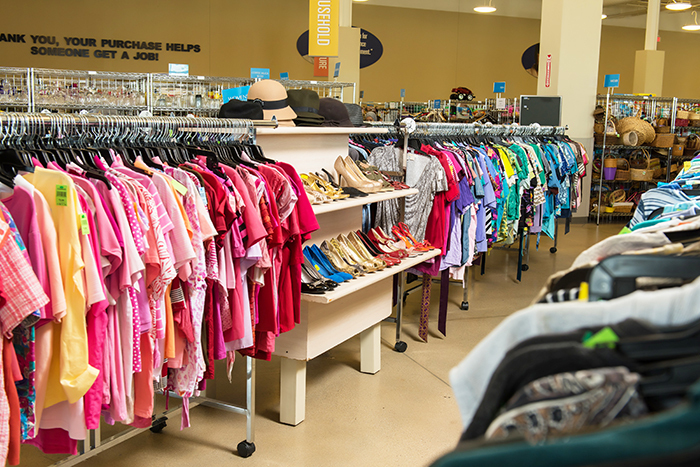 Most items are one-of-a-kind and there's no second chances.Try all Goodwill locations. Each store carries a unique blend of merchandise. No two stores offer the same selection of merchandise. Take advantage of promotions. Cash in on fabulous savings during promotions! Join Club Goodwill REwards for special offers.